A few months back, I got roundly criticized in these environs for grumping about the iPhone camera. It was (correctly) pointed out that a) I was using a phone that wasn't up to date, b) I didn't know how to use it, and c) I hadn't given smartphone photography a chance. Well, now I have, and here's my "camera review." I've been using the up-to-the-minute iPhone 6+ camera a lot. I'd say I've taken pictures with it every day since I got it. And I've had great fun with it. It's a very capable digital point-and-shoot; I like the wide lens; I've gotten lots of "nice enough" results (e.g. Winifred the Cat, above), and it's certainly highly convenient to be able to "communicate by image"—I've had great fun shooting pictures to friends. And pictures look great on the iPhone 6+ Retina screen. It's practical, too—for example, when I wanted to remember where my car was parked in the airport parking lot in February, I just snapped a picture of the location including the sign. When you want to remember a phone number from a billboard, a picture is quick and easy. And so forth. I can give good marks to the iPhone as a digital p/s. It's reasonably easy to hold and use, it starts to "get out of the way" adequately when you get used to it, and it's quite flexible. But now that I've done my duty, I'm going to go back to my real camera. The problem is that photographing, for me, is like deep-sea fishing for sailfish—you can do it for years and never get a strike, or (as happened to me when I was a boy) you can get insanely lucky and get five "bites" in one day. When you're fishing, and you get lucky and a fish takes your bait, you really need to be using the right tackle. Similarly, when I get lucky and the stars all align and I get a "real" picture I'm going to want to print—like that picture the other day of the Rockingham Meeting House—I really, really need to be using the right camera. I shudder to think how I would have felt if I'd encountered that scene with just the iPhone on me! It would have been just like, in the old days, having the wrong film in the camera. Fortunately, I had my Fuji with me on that occasion. The file is typically Fuji-amazing: not only is there detail in the brilliant glare on the roof, there's also detail inside the many-mullioned windows of the Meeting House. I stand the best chance of being able to make a good print when I have the file I want from the sensor I prefer and I'm using the lens I want. So I'm retiring as an iPhoneographer. The temperature just crossed the 60°F mark here in Upstate New York, which I understand makes this the first warm day of 2015 here, and I'm going out for a walk with my pet X-trans sensor and XF lens. But I have zero quarrel with anyone who enjoys smartphoneography—no problem at all. I've had great fun with all kinds of cameras, including toy cameras, antique cameras, a very early Canon Xapshot "still video" camera c. 1988, point-and-shoots—and now, a phone-cam. Mark Kinsman (partial comment): "Cat pictures and iPhones, kinda sums it all up, in a way." Stephen Scharf: "The dynamic range of my Fuji X-cams (shooting mainly with the wonderful X100T of late) continues to amaze me on an almost daily basis." Mike replies: It's really just such a blessing, for B&W especially. I earnestly wanted the D800 to "give me black-and-white back," but as much as I yearned for it to be the case, it just wasn't, quite. It was left for Fuji to actually give me the gift I sought. I'm going to write an ad for those people one day soon, I swear. Steve Sobs: "Poor Winifred's burned face. Apple, where's the tone curve control? Raw mode? Your solution to the highlights problem is limited to HDR - not exactly different thinking. While I'm griping, how about a way to set the default camera app for the lock screen, so I can quickly get to something more thoughtful like Camera+ or 645 Pro." Cat pictures and iPhones, kinda sums it all up, in a way. Although I do find many uses for the iPhone camera, it does make a great point and shoot. I totally get it Mike. Yesterday as I was hanging some photos for a mini show in a restaurant one of the cooks got excited about the prints and wanted to show me some photos he'd taken with his iPhone when he had 'gotten lucky' (right place at the right time). As he was showing them to me he wistfully commented, "I wish I'd had a better camera with em. I use my camera phone (Android) for a lot of the things you mentioned and it can be a "fun" tool but it just doesn't have the versatility of a quality dedicated camera. If someone goes "deep sea fishing" for Sailfish for years and doesn't get a strike, it's time to look for a new hobby. You did what I did....a flurry of iPhone photography to get my chops down, now it is always in reserve for moments like you pointed out. I've been using an "Eye-Fi Mobi" card in an RX-100 and a Toshiba Air card in an Olympus EM-5. They both offer slightly clunky but still useful ways of getting better shots from the camera to the phone for communicating by image. I feel very similarly, just on the next level of cameras: no matter how much I try to get along with smaller, lighter mirrorless cameras, I always end up back with my D4 and D800 and their monster lenses. It's a combination of knowing I will get the absolute best quality from their files (sorry, the Fuji X-Trans sensor just doesn't work for me) and having an efficient machine that never gets in the way. My latest attempt was the lovely X100T, but even though I really, really wanted to like it, I don't click anymore with it than I did with all my previous small cameras, iphone 5s included. I knew it would end like this. Couldn't be any other way. The Underground in London is plastered with Apple's latest iPhone ads showcasing photos taken with their camera. Not impressed, at all, at poster sizes; a tiny phone screen is about all they're good for. "The Emperor's New Clothes" springs to mind. Yes, I've got one and I take photos with it, but only as a last resort. I noticed at Mirrolessons.com, you were one of 30 bloggers in an article giving opinions on "best mirrorless cameras", and your three didn't include a Fuji. I'm curious how/why you chose the three you did...and why you left out the one you've chosen for your own use. All good cameras,for sure...I'm just curious. Secretly I want Fuji XT1 with Fuji's magic on a 16MP Bayer ... One can but dream. I don't think I have taken more than two or three photos with my Galaxy S2 smartphone, since I always had a Sony RX100 in my pocket. But the RX100 just died, so I may have to resort to the Galaxy for a while, but I don't think I am going to like it. "Mike replies: It's really just such a blessing, for B&W especially. I earnestly wanted the D800 to "give me black-and-white back," but as much as I yearned for it to be the case, it just wasn't, quite. It was left for Fuji to actually give me the gift I sought." There is just *something* about the files from Fuji cameras that is hard to describe. Colors, skin tones in portraits, and the B&W images are just magical. I really think it comes down to Fuji really understanding things like optics, color, luminance, and their expertise in film manufacturing. These guys just "get it". My biggest gripe with the iPhone (or similar): It never fails that my battery is down to 2% the second I want to start shooting, and it bites the dust shortly thereafter. I don't know how many times this has happened to me but it's gotta be close to 100. Absolutely, Mike. Many of my best-selling images were unplanned, and would have failed if I hadn't carried my dSLR. An iPhone photo would not only have failed to give me an image that would blow up to a decent size for gallery and sales, but it would have kept me from choosing the depth of field I wanted, would have limited the dynamic range, may have been grainier than I wanted, etc, etc. Unless I'm just out on a quick and casual trip around town, I still lug the dSLR and an extra lens most places. In fact, if I'm out and about without the camera bag, I'm constantly turning around to see if I left something behind. The iPhone is just another weapon in the arsenal. Not the main weapon in my arsenal, but a fun one. I almost never catch you doing anything like this, but just this once--first time I read "The problem is that photographing, for me, is like deep-sea fishing for sailfish", I immediately associated *you* and the *sailfish* as the things being compared. The grammar doesn't *quite* support that reading if I look closely, but that's the thing that first caught my eye anyway :-) . I wrote to you recently about an observation of mine that people who take photos with phones inevitably hold the phone in the horizontal position. I commented that they would hold the phone that way at the Grand Canyon. Well, it's painful but true. I just returned from Yosemite where everyone save one person I saw was holding the phone vertical (with one hand). That one person was taking a shot of seven people sitting on a wall at Tunnel View (with one hand). Anyone want to build a two hand horizontal app for 99 cents? For me, the big turning point in largely abandoning my smartphones as regularly-used imaging devices was the introduction of NFC with the A6000. Previous iterations of the NEX cameras (NEX-6, in my case) had the ability to connect via WiFi, but it was clunky- the NFC chips have taken all of the hassle out of connecting the two devices together. Now, when I want to quickly share a picture... I can take a picture with a real camera, tap my smartphone to it, perform a few basic edits if desired, and then share it to any number of services with just a few taps- Smugmug, Facebook, email, MMS, etc. I am happy to put up with the slight amount of extra work in order to take as many pictures as possible with a real camera, not a smartphone. Not having to pull the chip to dump the files onto the computer, import into Lightroom, process, export, etc has made the A6000 MUCH more useful to me than the NEX-6 was. I'm content to use my iPhone camera for whenever I have nothing else with me and/or it is sufficient for the intent of the photos. It's particularly fun to use in conjunction with the Impossible Instant Lab to make Polaroid prints. While clearly more photos are taken today with I or A something type phones and I only expect this to increase by dint of pure statistical volumes, I hope this will push Fuji, Olympus, et. al., to continue to create CAMERAS that PHOTOGRAPHERS want to use, and love! I believe this is the only way they will stay relevant in the future and not be relegated as a footnote in the history of photography! I'm sorta doing your "one year, one lens, one camera" with an iphone 5s atm. I gave up on trying to be consistent with my bigger camera, and instead committed to posting a picture for each day (minimum) on instagram (which I suppose is pretty much like making a print of a picture). I'm allowing myself to not necessarily shoot every day, just to keep enough of a good-shot backlog to have 365 pics posted by the end of the year. So far (day 60 today), it's been great for reconnecting with photography, and for figuring out the kind of shots I can and can't get on the phone. I'm currently considering getting some of the instagrams printed so that I can be exposed to them a bit more continously, like you suggested in your updated one-year project. Yeah, absolutely, glad you got there Mike. If I don't have something with me that can capture a raw file, and with which I can choose aperture and lens speed, then I don't have a camera with me. It seems the worst danger to a photographer is the thought, "Oh, I don't need to bring a camera along. I've got my phone." But what that means is you don't have a camera with you, really. You've only got the means to do some quick and dirty documentation or maybe something that will turn out just right and make a small print. For me it used to be the choice between the bulky DSLR system (and how many lenses should I bring?) vs something like a Canon G11 or some kind of point and shoot. In those days the point and shoot was a compromise, but I find with software like DxO (not so much ACR), I can pull some good images from those old raw files. If you've got a raw file, you've always got the potential to pull something out of an image beyond the first impression. As demosaicing algorithms improve, you've got more and more potential from those files as the years go by, which is weird but good. My old raw point and shoot files now make much better images than they could were when they were fresh from the camera. Now I have mirrorless cameras with decent sensors and fantastic lenses. There's no excuse not to bring the little bag along, unless I really want to be unencumbered by photography altogether. Well, your journey with iPhoneography has been instructive for me, so I thank you for that. I think it boils down to how one uses (and feels about) a tool, and I align with your take on it. The RX100 is a very high quality, eminently pocketable camera. You can always carry it with you. I prefer the zoom range of the original model / Version 2 (28-100 equivalent), the RX100 Mark 3 is faster but less long (24-70 equivalent). Since I started carrying it I stopped using my iPhone camera. I always carry my Olympus 35RC and a spare roll of tri-x for those just in case moments. I’m sorry, but I disagree with those that think the iPhone camera is useless. My daughter in law took this photo of the moon with her iPhone 6 handheld at the eyepiece of my 5" inch refractor telescope. Any other camera, DSLR or Mirrorless would have been very hard to use handheld without shaking the telescope. In some situations, the iPhone 6 is a fantastic camera. I did an 11 x 14" print of it, which is very nice and sharp. Who can argue that great photographs are not possible with cell phone cameras. The OCOL challenge is something I have understood, without actually comprehending....Until recently. I now own a good copy of the ancient Pentax 35mm 2.3 pre-set lens. This lens seems to be so imperfect, in such perfect ways, that there is no chance such a creation would be marketable as a new item today. Was it Schopenhauer that said: "When we begin analysis, we begin to lose understanding"? It is a strange statement, but, at work, modeling/analysis takes on a greater and greater role, and as it progresses, things just seem to become more and more meaningless....On the human level. Using my Iphone camera is kind of like taking pictures with something generated through predictive modeling. It works great, and a majority love it. Taking pictures with the Pentax 35 pre-set is like, well, enjoying a hobby. Like I matter. The iPhone's great strength his not as a still camera, but as a videocamera and video note-maker. Even in its latest incarnation the HD video quality in broad daylight is superb especially with good handholding technique and when viewed on a large screen TV. The iPhone is more about communication; we take pictures as reminders, snap a product or snap a list- it is great for that. Kids in school use them to communicate at all levels and are probably the leaders in its use and there are probably some new photo apps out there, which we don't know about but with which they are flooding their friends. People at pop concerts use them to block everybody else's view and record jiggering films with awful sound levels which then then flood YouTube with. Others use them to Twitter, Twatter and whatever. What we call photography is only a minor part of iPhone usage. One major benefit of the IPhone is that many people have one which means that almost every news or interesting event can be recorded while it is happening, often before the traditional media have even heard about. The plane landing in the Hudson is possibly the epitome of that. What is not good is that so many film clips are so badly recorded as the camera is rarely still. However, walking down a road recently I came across a man going crazy. What he was angrily saying and doing was possibly newsworthy so I took out my iPhone and started recording. I couldn't hold it up to make sure it was perfect as I worried that it would attract his attention with serious negative consequences and so I tried to nonchalantly hold it as I walked along. Worst film clip I've ever seen as it jiggers from sky to my shoes, back to the road and only fleetingly caught the man. But sometimes you don't have any tackle. I don't use digital anymore except for the phone. Nothing I had would have got this. 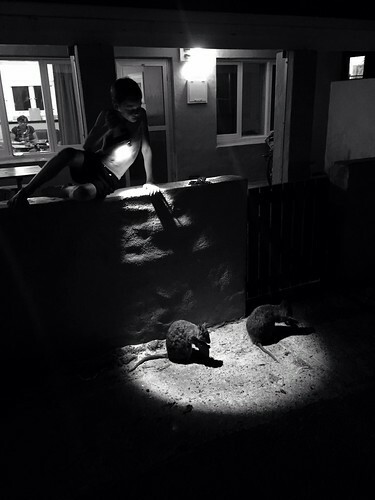 Boy with torch and quokkas iPhone. I think the objection was that you were objecting ideologically rather than in reality. And I'm not 100% sure that you're still not hoping for it to fail while praising it for being able to take shots of phone numbers on billboards. I'm certain the phone would have done a fine job on the Rockinham building. Shuddering is not required. But MP3 players are terrible hi-fi's. Unless you put an "i" in front of them. I thought I would love having a phone with a camera and I've tried all kinds of apps to make it fun. But, I just don't enjoy it and am never satisfied with the results. I did get a cover of a local magazine once from a phone photo. The editor saw the pic on my Facebook page and wanted it. I tried to talk her out of it, but she wanted it. So, in the end I gave it to her. It looked okay.